Bamberg is a town that’s not only famous for its medieval heritage, but is also noted for its excellent beers. For its small population of 80,000, Bamberg has nine breweries which brew some fifty different types of beer. A specialty of Bamberg is rauchbier, a “smoked beer“. On our river cruise stop at this town, passengers were recommended to try this specialty beer and the place to go to is the Schlenkerla tavern at No. 6 Dominikanerstrasse. It’s in the middle of the old part of town, near the cathedral. Smoked beer certainly is an acquired taste and even some of our fellow Australian passengers, who are hardened beer drinkers, did not finish their drink. This is quite unheard of! I thought it tasted a bit odd, a bit like beer that’s been infused with smoked ham! The truth is that the malt is roasted over beech fire to give it that smoky flavour. Schlenkerla tavern has a history dating back to 1405 and has been run by generations of the Trum family. Walking around the tavern, you’ll notice interesting features. On the walls there are numerous historic engravings of Bamberg, like the “World Chronicle of Schedel” from the year 1493. The family tree of the Trum/Graser family can also be seen. The “Dominikanerklause” with the arched ceiling dates back to 1310. The “Klause” used to be the house chapel of the Dominican monastery and was used for daily prayer. During secularization the monastery was closed down and all its buildings were nationalized by the State of Bavaria. The “Klause” was later sold to the Trum/Graser family. 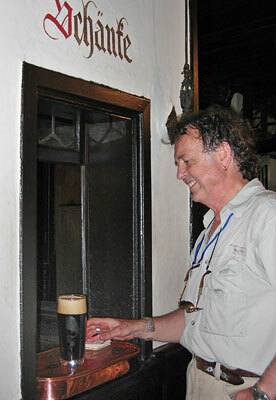 The original Schlenkerla smoked beer is still being tapped directly from the wooden barrel according to the old traditional way. If you wait at your table for service, you’ll go thirsty. To order a beer you’ll need to go to the small window in the wall, ring the bell and the bartender appears at this hole in the wall and serves you your beer. Amongst the group of passengers who tried rauchbier, Tony was the only one who finished his drink. The colour of the beer may be as dark as Guinness, but it certainly is no substitute for the mighty Guinness.